2014 marked the 6th year Rebounces has partnered with BNP Paribas Open and Indian Wells Tennis Garden to recycle tennis balls collected at the BNP Paribas Open. What began as a one day event in 2008 has now expanded to include all four weekend days, 1,000s of tournament patrons and dozens of tennis clubs and facilities in Southern California. 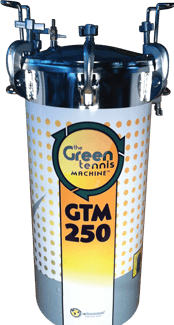 To encourage the more than 340,000 attendees of the BNP Paribas Open to help green the game of tennis, reBounces, BNP Paribas Open and Indian Wells Tennis Garden sponsored a tennis ball recycling program onsite at the event. Tennis fans were asked to bring in six old balls in exchange for a can of three new ones. At the end of the spectacular event, over a ton of tennis balls were packed and shipped back to reBounces HQ in Arkansas diverting them from an immediate trip to the landfill. Find other testimonials throughout our site and be sure to get a GTM150 starting at $69/month. If you’re a member of a tennis facility, Home Owners Assocation, Independent Teaching Pro or School (HS or College), you should consider recycling your old tennis balls on-site a few times before you send them to reBounces. Utilizing our patented, revolutionary technology, you can now restore dead tennis balls in bulk back to their original bounce! 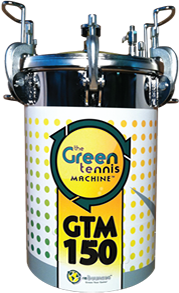 The Green Tennis Machine extends the life of your practice balls, improves ball consistency in your teaching baskets, helps by saving money on practice balls, and reduces the amount of tennis balls purchased and put into the waste stream.